Published – June 5th, 2018. “My little brother and I saw a unicorn in the garden in the late nineties. The Terrible, Yrsa Daley-Ward’s brave, raw, lyrical memoir that captures the surreal magic and incredible discomfort of adolescence, burgeoning sexuality, rootlessness, and connection. Through emotional snapshots that span from her adolescence through her early twenties, each brought to life in Yrsa’s signature style of open white spaces and stirring, singular lines, The Terrible evokes the pain and thrill of girlhood, as well as what it means to discover the fear and power that come with being a woman. With a sharp eye and a rare talent for mining the beauty and the sorrow in the everyday, Yrsa recounts her remarkable life: growing up as one of the only black children in a poor, white, working class town; navigating the extreme Christianity of her family; inquiring after her paternity; moving through phases of addiction and sexual encounters; and ultimately finding her place in her family and in life. This book is so terribly good, it carries Yrsa’s essence from the onset to the end. It is one dark tale, with glimpses of lights here and there, but so dark and powerful, Yrsa can’t help but capture my attention with her story. To me this memoir is one of a kind because it is truly a piece of art, it’s like reading a beautiful long poem, verse-prose? that starts with how she came to be in this terrible hard world and how from an early age she had to learn to always look out for herself, in order to not get swallowed up. The books touches on the power of the feminine sexuality, being sexually intimate from a young age, embracing being queer, despite religion, infidelity, confusion as well as discovering oneself, neglect, dealing with mental issues, parenthood, family, race and immigration etc. Even now after almost two days of reading this book, it still lingers on my soul, the words I’ve read and digested painted across my being. All I can say is you give this memoir a try, and fall in love with Yrsa’s writing. 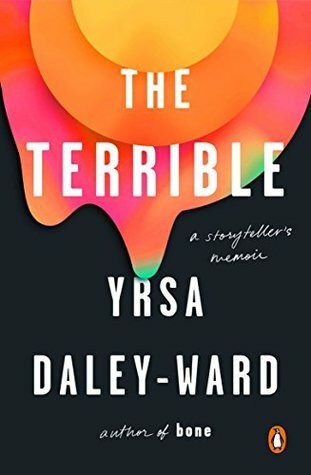 The Terrible by Yrsa Daley-Ward is deep-cutting and an amazing example of the art of storytelling—when writing is done well to encompass the truth. Yrsa Daley-Ward is a writer, model and actress and poet of mixed West Indian and West African heritage. Who was Born to a Jamaican mother and a Nigerian father in England, Yrsa was raised by her devout Seventh Day Adventist grandparents in the small town of Chorley in the North of England. She is known for her debut book, Bone, as well as for her spoken-word poetry. Her memoir, The Terrible, was published in 2018. Blog Tour: Not the Girls You’re Looking For by Aminah Mae Safi | Book Review, Authors Guest Post & A Giveaway! This sounds like a really beautiful work! I’m definitely going to have to try to pick it up soon. You definitely should, I think you won’t regret it. I am going to re-read Bone very soon. Thanks for commenting and the writing in this book is like reading poetry.